Ald Gerardine Mulvenna is a member of The Larne Renovation Generation group. 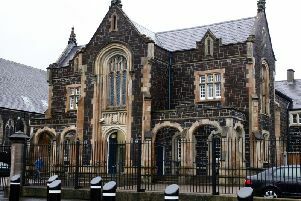 The Larne Renovation Generation has reacted angrily to a vandalism attack on a display at Pound Street on Saturday night. The incident has been described on social media as “mindless”, “despicable” and “senseless behaviour”. The group has been busy sprucing up Larne ahead of the arrival of the Great British High Street judges on October 10. Its members have been at the forefront of efforts to “regenerate Larne into a creative cultural hub for local people and tourists to enjoy” through a series of floral displays and other initiatives including the colourful bikes at Broadway. Larne is one of three finalists in the Rising Star categories of the awards alongside Bow Street in Lisburn and Armagh city centre. Each will be judged on community, customer experience, environment and digital transformation. A town centre clean-up by the group has included alleyways between Main Street and the Laharna Retail Park and Main Street and Exchange Road. Other environmental improvements in the town centre have included street art and “yarnbombing” as well as new paving and street lighting. Angeline King reported; “The disability bike has been pulled apart, plant pots broken up, soil spilled in the space at the bottom of The Roddens”. The disability bike had been donated to the group. Commenting on social media, one woman described the incident as “disrespectful”.